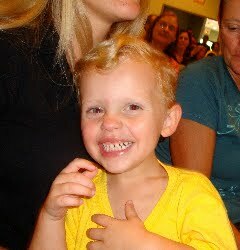 This was Dawson's second year to attend VBS at church and he had a blast. Kaelin and Dawson on the 1st day of VBS. Brady and the other 2 year olds on the front ready waiting for the puppet show. Dawson walking down the isle with his group on "family night." Dawson and the other 6 year olds on stage. Brady all smiles and giggles (thanks to Angie) as he sat through the kids performances.